I remember playing some sports, like kabbadi1, gollachut2, athletics, kite flying and so on during my primary school years in our village, among which kabbadi was the most popular. Watching elders play football, we also became interested in it, but didn’t have a ball to play with, so we used an unripe grapefruit as the ball. Observing our interest in football, my grandfather asked a cobbler to make a leather football for us with cotton inside it so that we could play in our own backyard rather than with the mischievous boys of the village. He used to be the referee sitting on the veranda while we played. When I was at Barail Junior Madrasah I used to love the PE3 lessons and used to practice them with others at leisure time. There used to be competitions in kabbadi, football and athletics, but I was not as good as others in those sports. I used to go and watch annual sports competitions of some famous schools at that time. I never tried to be a sportsman, probably because I didn’t think I had the potential, but I enjoyed watching others play. When I was in Comilla I once collapsed with sunstroke while watching the annual sports of a Hindu school called ‘Ishwar Pathshala’. I used to play volleyball regularly while I was in Koltabazar Hostel in 1940, and continued to play the sport the following year in the college ground. I realised that although I was not good at football, I played volleyball quite well. While I was staying at Paradise Hostel during 1941-42, I could play volleyball at the hostel premises rather than having to go to the college ground. In the absence of the required equipment for volleyball we would play badminton, which I liked even better. I had a slightly taller friend called Amin Uddin with whom we formed a doubles team, calling ourselves ‘Hopeless’, and we won the college championship that year. The principal was very amused at our name and while giving his speech during the prize giving ceremony he said, “The doubles team of Ghulam Azam and Amin Uddin were so confident of winning that they called their team ‘Hopeless’ to surprise everyone.” Our ‘Hopeless’ team was revived in 1944 when Amin Uddin and I were in the same student hall (Fazlul Haque Muslim Hall) of Dhaka University. We maintained our reputation by becoming the hall champions for two consecutive years. Our team ended naturally after Amin Uddin left university in 1946. I also played volleyball regularly during the dry season in the hall compound. When I went back to Chandina for holidays I played both volleyball and badminton in the high school grounds there and became known as a good player in both these games. I formed a badminton doubles team with Professor M R Helali of the English department while lecturing at Rangpur Carmichael College, although we never took part in a competitive game. I also played badminton, having been inspired by a Jamaat leader when I was in Lahore Jail in 1964, with other central leaders of Jamaat-e-Islami after the then President Ayub Khan banned Jamaat. We used to play against each other and leaders like Mawlana Mawdudi and Mawlana Abdur Rahim used to enjoy our competition and acknowledged that we were good players. As I used to win most of the time, they wanted to know whether I had played badminton during my student life and I had to confess that I had been the doubles champion in my hall. I was later transferred to Dhaka Central Jail upon my request so that I could see my family every fortnight. There were no badminton facilities there, but I would play rings with one of the Jamaat leaders there. Although cricket is the most popular sport in our country, I still like football more. Unlike cricket, one doesn’t have to wait long to get a result in football. Sometimes a cricket match continues for days and the crowd sit and watch the game for a long period of time. It may be worth it for players to watch the game like this in order to learn and devise tactics, but I have to admire the patience of the crowd who spend such a long time watching the game. I definitely don’t have this strange patience. It is not only in stadiums; many people stop their work and watch the game on television for hours and hours. As the results and analyses of these matches take up prominent spaces in newspapers, I also read some of them and try to find out who is winning. However, I don’t have the competence of a supporter or a follower of the game like others. I have my own perspective on sports. I feel that sports have a role to play in physical activities and entertainment and some people may be very passionate about them, but I find it difficult to understand why people would take up sports as a profession. Many players in the world have a huge income as professional players and don’t need to be involved in any other profession. I also acknowledge that some players have improved the sports they play at a very high level and have achieved remarkable feats. However, as a believer of life after death I wonder what these people will answer to Allah when asked what they did in this world. Is the purpose of this life just to play? Should one choose sports as their primary way of life? On the other hand I do admit that sports can inspire the youth and they can play positive roles in the society. Elderly people are also inspired by sports and can enjoy it as a form of entertainment. From these perspectives one cannot ignore the significance and contributions of sports in the life of citizens. As already mentioned I am not fond of cricket and don’t waste my time watching the game. However, everyone in my house loves the game and although their over-enthusiasm sometimes annoys me, I don’t stop them from enjoying. One of the pleasures of watching a game is shouting and yelling with other compatriots. Those who are unable to go to the stadium become their spiritual comrades watching it on TV. When all of this happens, I find myself isolated and unwanted in my own house. “Cricket has conquered the world. It has brought the whole world together – not through the power of weapons, but through the beautiful means of discipline. (…) How beautifully cricket has transcended geographic boundaries and united the world! It has brought people together by destroying their differences in terms of race, language or culture. (…) I read in the religious scripture that ‘Allah is beautiful and He loves beauty’. We can’t see Allah, but we can feel His beauty by seeing His beautiful creations. Cricket is one such beautiful creation of Allah and we bow down towards Him for gifting us this beautiful game”. Although I am not influenced by Salman’s philosophy and deep emotion towards cricket I do acknowledge the huge popularity of the game. When in 1999 Bangladesh beat Pakistan in the Cricket World Cup in England, the Prime Minister Sheikh Hasina commented, “This victory was possible because the players played with the spirit of 1971.” However, Bangladesh was defeated by Pakistan the following year in Dhaka with Sheikh Hasina present in the ground. I could not understand why she herself could not bring that spirit back to our players. Cricket is just a game and she made herself a laughing stock by bringing the Liberation War into the game. Bangladesh’s victory was not due to the spirit of 1971, neither was their defeat because of the lack of it. Victory and defeat in sports depend on performances on the ground – nothing else. India and Pakistan are top teams in world cricket. Pakistan has won more matches between them than India, but I am not sure whether the ‘spirit of 1947’ had to do anything with their success against their arch rivals. When these two teams play against each other in Dhaka, most people support Pakistan. My impression is that this support is more to do with people’s negative attitude towards India than their love towards Pakistan. Awami League leaders consider India their close ally despite most people in Bangladesh supporting teams that oppose India. Does this mean most people in Bangladesh are Razakars5? Who are the patriotic people then? I can see similar political significance in India-Pakistan cricket matches to that which I used to witness between Mohammedan Sporting and Mohun Bagan football clubs during my student life. 1 A traditional sport in rural Bangladesh, also played in wider South Asia and is a competitive game played at Asian Games. 2 A traditional rural sport that is less played in modern times. 4 Someone who has memorised the whole Qur’an by heart. 5 A pejorative term referring to members of a paramilitary force created by the Pakistan Army during the Liberation War of 1971. When I left my Arabic studies, I had decided to study political science for my postgraduate education after my graduation in 1946. The Political Science department at Dhaka University was quite old and had good reputation, whereas political science and economics were under the Department of Political Economy in Kolkata University. I was not interested in going to Kolkata as Kolkata University was not a residential university like Dhaka. In addition, I liked the department in Dhaka University. However, my father wanted me to study in Kolkata and stay with my uncle Shafiqul Islam. I was told to stay with him in the famous ‘Bekar Hostel’. My planned day of departure was 16 August 1946 and I was preparing accordingly. Incidentally, this was the ‘Direct Action Day’ in Kolkata, declared by the Muslim League to protest against the efforts of the Indian National Congress against the formation of a separate nation for Muslims. Therefore, it was suggested that I leave after observing what happened on that day. The Muslim League had no plan to instigate a Hindu-Muslim riot and the Muslims were not aware that the Hindus had been well prepared for slaughtering Muslims on that day. Many Muslims lost their lives after being attacked by armed Hindus, and Muslim properties worth tens of millions were destroyed or looted. Many Muslim women were raped on that dreadful day. As a result my planned study at Kolkata University had to be cancelled and I enrolled myself in the department where I had wanted to study after all and continued to stay in my favourite hostel, the Fazlul Haque Muslim Hall. I was a hall resident from 1944 to 1948. The hall union election used to be held every year, although the university union election was a bit irregular. At that time Salimullah Muslim Hall had a strange system in their hall union elections. More than half of their students were from Greater Comilla and Greater Noakhali districts, and they would work together to ensure that their own people won the elections. A student in our Fazlul Haque Muslim Hall named Nazmul Karim took an initiative to ensure that this type of district nationalism did not take place in our hall elections. He led a movement to resist district nationalism and asked me to join his movement as I was from Greater Comilla. His movement became successful and no district nationalism could be observed in our hall union elections. Two panels would contest in elections and each year the names of these panels would change. Generally names like ‘Progressive Front’, ‘Democratic Alliance’ etc. were popular in these elections. No student front of any political parties were active in Dhaka University at that time, although they were active in Kolkata University. I was actively involved with the Nazmul Karim panel in the 1944-45 election in which he was elected the Speaker. The constitution of the Fazlul Haque Hall Union was different from other halls, which was aimed at developing students in the system of parliamentary democracy. The hall provost would be the president of the union and would attend only the inauguration session. The Speaker would preside over the debates while the elected Vice President (VP) would act as the Leader of the House. I was the chief election officer for one of the panels in the 1945-46 hall union election, with Sarder Fazlul Karim as its VP candidate. At that time communism was becoming popular as an ideology, and meritorious students of the university were attracted towards it. I too was influenced by them for a brief period through their leaflets and other publicity materials. The other panel was led by Matiur Rahman, who successfully convinced the voters that Sarder Fazlul Karim was a communist and won the election despite being far less efficient than our panel. The environment in those elections were fully democratic. One of the main leaders of our opposite panel, Ismail (who later became a minister during the presidency of Ziaur Rahman), was my close friend and we would often ask each other how our campaigns were going. Everyone would accept the results in the spirit of sportsmanship. Matiur Rahman, the elected VP, would often ask me to write posters for him and I obliged despite being from his opposite panel. I tried to know more about communism after that election and soon realised that their materialistic ideology was against religion and leads to atheism. My faith in Islam was so strong that communism as an ideology had no chance to win over me. The Hall Union election of the 1946-47 academic year took place during the first year of my MA. I was quite known to others due to my involvement in the previous year. I was not the kind of person who would remain uninvolved in an election, so I decided to be active in the election of 1946-47. One of the panels was headed by Muazzam Hossain Chowdhury of the Department of History and when the other panel was being formed under the leadership of Azharul Haque Chowdhury of the Department of Economics, Chowdhury announced that he would not stand as the VP candidate unless I agreed to stand as the General Secretary (GS) candidate. I was not prepared for this. I was ready to actively work for his panel, but I had to give in to his pressure and contested the election. Our opposite panel led by Mr Hossain won the election, but I was surprised when I heard that I was the only person elected from our panel with record number of votes. I had no problem working with the other panel and I developed cordial relationship with the elected vice president. There was no party politics in university at that time. The heated political climate of 1945-46 did not affect the academic environment of the university. Dhaka was not as affected by the political struggles as much as Kolkata, the capital of the then Bengal region. The Indian National Congress had very little presence in Dhaka as none of their leaders were based in Dhaka, although some of them were practising law in Comilla. Therefore, student politics was limited to hall and university unions only. The Muslim Students’ League was the only notable student organisation at that time, but they were not active on campus. Politics outside university was mainly led by the Muslim League. Even the language movement was not organised by any particular political party, and the Muslim League became very unpopular among students due to their negative role during the language movement. The university union, known as DUCSU (Dhaka University Central Students’ Union), was previously known as Dhaka University Students’ Union. The word ‘central’ was probably added later to use the acronym DUCSU. The elections of the university union was not held every year in the way that the hall union elections were, but that did not create any problem because most student activities were based in student halls and the university union had limited functions. There was no university union election when I started university in 1944, so the first university union election I witnessed was the one for the 1945-46 academic year. There was only one panel contesting in that election, but we had little scope of knowing the candidates well. The campaign was not nearly as exciting as the hall union elections. I only remember one independent candidate called Farid Ahmed of the English department giving a speech in the common room. He immediately caught everyone’s attention as an eloquent speaker and I too decided to vote for him despite not knowing him personally. There were 16 members in the only panel that contested the election and some independent candidates contested against them. I voted for 15 of the 16 members from the panel and gave one vote to Farid Ahmed. He won as an independent candidate, and later became known as Moulvi Farid Ahmed, the leader of the Nizam-e-Islam party. If the VP was a Muslim, then the GS would be a Hindu. The VP and the GS would be nominated from each hall by rotation. In this system the VP post went to Ahmedul Kabir of Salimullah Muslim Hall for the 1945-46 session (who later became the editor of the Bangla daily ‘Dainik Sangbad’). I cannot remember the name of the Hindu GS of that year. There was no colourful inauguration like the hall unions and I don’t even remember if any significant event took place under the leadership of Ahmedul Kabir. In the middle of that session Ahmedul Kabir’s student life ended and Farid Ahmed was nominated as the VP. There was no election of the university union in 1946-47, so the next election was for the 1947-48 session when I was in the final year of my MA programme. The rota system meant that the VP would be a Hindu from Dhaka Hall and the GS would be someone from Fazlul Haque Muslim Hall. I was actively involved in the hall union election supporting my classmate and friend Toha (later known as Comrade Toha). His room was next to mine in the hall and we actively worked together in the language movement. After Toha was elected as the VP, he insisted that I stand for the GS election of the university union. Arvind Bose from Dhaka Hall was nominated as the VP candidate. Although there was only one panel, quite a few students contested as independent candidates, so it became important to campaign for our panel. Arvind Bose and I both campaigned hard going to every room of every hall, and everyone believed that we two would hold the VP and GS positions respectively. The campaign continued for two weeks in which we not only reached every hall student, but also collected addresses of non-resident students and went to their homes. We had to make sure that every voter had been reached so that no one could say we had not approached them. In doing so, we became extremely tired and exhausted. Our hard work paid dividends as our panel won by huge margins, with none of the independent candidates coming even near. The pleasure of success is unique, and the exhaustion of the previous few weeks disappeared almost instantaneously. We then had to meet everyone to thank the voters and shake their hands for supporting us, and my face ultimately began to ache due to smiling continuously for hours and hours. The president of the university union was the Vice chancellor Dr Syed Muazzam Hossain, who was the head of the Arabic department when I was doing BA Honours in Arabic. He was extremely handsome and smartly dressed with the attire of a perfect English gentleman. He was always seen wearing his hat on the university campus. The inauguration took place in a grand ceremony at Curzon Hall with the Vice Chancellor in the chair. However, as discussed before, the activities of the university union were quite limited as hall unions had more active roles in different matters. The activities that we had to arrange centrally included inter-hall literary competitions and inter-hall sports. As mentioned, the university union had no involvement in national politics. During my tenure as the GS of the university union we arranged two major programmes that were beyond the regular activities of the union. The first was a reception in honour of the then Minister of the Pakistan government, Dr Mahmud Hossain. He had been a Reader of the History department of Dhaka University and was also the Provost of my hall when I was the GS of the hall union. The second event was the reception given to the then Prime Minister of Pakistan, Nawabzada Liaqat Ali Khan, on 27 November 1948 at the University Gymnasium Ground. Named after Lord Curzon, it is one of the landmark buildings of Dhaka University built by the British. It is now the building of the Faculty of Science. It was at this event where the first official demand for Bangla to be recognised as an official language of Pakistan was made through a memorandum that the author read out as the GS of the union. The details of this event will come later when the language movement is discussed. As mentioned before my teacher in junior madrasah Mr Shamsuddin sparked my interest in reading for which I will never forget him and will continue to pray for him from the core of my heart. I would take books from the madrasah library and continued to do so while in high madrasah, although there was no one like Mr Shamsuddin to guide me to which books to read. When I was in Islamic Intermediate College in Dhaka I again started taking books from its library, and upon observing my progress in Bangla in the half-yearly exam, the Bangla teacher Mr Aminuddin suggested that I should read the short stories of Rabindranath Tagore to improve my Bangla. I was startled by the beautiful literary style, linguistic elegance and philosophical teachings of those stories. My eldest two sons Mamoon and Ameen were students of Dhaka College in 1971. As the situation in Bangladesh was not good, in 1972 they and my brother Dr Ghulam Muazzam’s eldest son Suhail went to England to study there. When I met them in 1973 after two years I realised that there was no scope for them to practice Bangla in that country. At that time I remembered the prescription of my Bangla teacher Mr Aminuddin and arranged to bring all the volumes of Tagore’s Galpaguccha (Collection of Short Stories) from Bangladesh. I became very attracted to Bangla novels while studying at intermediate level and, upon seeking Mr Aminuddin’s advice, he suggested I read Saratchandra’s novels. Before sleeping, I would read non-academic books, but the storylines in novels were such that it was difficult to go to sleep before finishing a novel. Lack of sleep was beginning to affect my studies, so I went back to Mr Aminuddin for advice. He shook my shoulder and said, “Make a decision that you will not read for more than an hour before sleep, and when it is time to sleep you will stop reading. You need to know how to control your mind.” This advice was instrumental in aiding me to strike a balance between reading and sleeping. When I was in secondary school I was fond of the poems of Kazi Nazrul Islam in my textbooks. My cousin and classmate Abdul Quddus sang Nazrul’s songs well and I obtained Nazrul’s poetry collections through his help. We would organise internal programmes where Abdul Quddus would recite Nazrul’s poetry, which had all the ingredients to attract the youths – revolutionary poems that would inspire us tremendously. I was introduced to Rabindranath’s poetry in university. Tagore’s Sonar Tori (The Golden Boat) was our text in Bangla literature, which was beautifully taught by Professor Biswaranjan Bhaduri. He talked a lot about Tagore’s poetry, so I asked him to recommend books that would inform me on the famous poet’s work. He told me to read a book of poetry criticism called Rabirashwi (The Light of Rabi) through which I became a fan of Tagore’s poetry as well. His poems were completely different from those of Nazrul in terms of language and content. They were both beautiful flowers for me, but with different fragrances. That is why the appeals of Tagore’s and Nazrul’s songs are very different. Nazrul is the national poet for Bengali Muslims while Tagore is the emperor of Bangla literature. As I was intrigued with Bangla literature I was not contented with only two lectures a week in university. Only those who took a module called ‘Special Bengali’ could attend six hours of Bangla lessons a week. However, I came to know that there was a class on novels taken by Professor Ashutosh Bhattacharya, which did not clash with any of my lectures and I started attending it with his permission. He would analyse the characters in Bankimchandra and Saratchandra’s novels, and as I had read the novels before, I really enjoyed the discussions. I soon became his favourite student, despite not being an enrolled member of his class, due to my enthusiasm and ability to answer different questions. I later achieved the highest results in Compulsory Bengali in my BA final exam held in 1946. I was actively involved with the East Pakistan Literary Society and was its assistant secretary when Sardar Fazlul Karim was its secretary. I was very close to the president of the society Qazi Motahar Hossain as he was my house tutor in our student hall. I later became its secretary in 1948 during my MA. My relationship with Syed Ali Ahsan and Syed Ali Ashraf, the two famous brothers, developed during my activities with this organisation. I was very lucky to have acquaintances with some legendary figures of Bangladesh like poet Kaykobad, Professor Ibrahim Khan and many more due to my involvement with this organisation. Since my boyhood I had been fond of Nazrul’s Islamic songs sung by singer Abbas Uddin, and although I never tried to be a singer, I would often sing those songs myself. I read Tagore’s Gitanjali (Disambiguation) after my BA exams and memorised some of my favourite poems and would recite or sing them alone sometimes with great pleasure. When I read the Masnavi by Mawlana Rumi I discovered that it had a lot of similarities with the poems of Gitanjali. Later, while reading works of Swami Vivekananda I came to know that Tagore was greatly influenced by Mawlana Rumi’s works and would often recite his Persian poetry aloud in his room. The poems of Gitanjali are devoted to the Creator with songs on surrender to God, supplication to Him, emotive appeals to the Creator and immense love for the Almighty. Whilst in jail in 1964 I wrote some of these emotional poems in a diary and have retained the diary all my life. I was surprised that the materialistic people in the West decided to award the Nobel Prize for a book of religious nature, and came to the conclusion that there is an underlying belief in the divinity behind the so-called materialism they claim to possess. The anti-Muslim sentiments that are found in Tagore’s writings are political thoughts of an Indian Hindu. He acted against Muslim interests by being strongly against ‘Bangabhanga’ (The Partition of Bengal). He was guided by Hindu nationalism, so only the inhabitants of this country who possess Bengali nationalism and are Indian in their hearts can ‘worship’ him as their national poet instead of our actual national poet Nazrul Islam; those who believe in Bangladeshi nationalism do not think in this way. I love literature, but I am not a litterateur; similarly I am fond of good songs, but I am not a cultural activist. Those who become inherently litterateurs start writing from a very young age. As practice makes one a singer, continuous writing makes one an author. If I was inherently a litterateur then I would have been writing from my student life. Despite being actively involved in the East Pakistan Literary Society I did not develop the habit of creative writing. I only remember writing a piece of political satire called ‘Indian Politics in the Hereafter’ for the Dhaka University Magazine in 1946. It was an imaginary discussion after death between prominent politicians of British India like, Gandhi, Nehru, Jinnah, Patel, Mawlana Azad, Subhash Basu and so on. I consider myself as a person who loves literature, but due to my active involvement in the Islamic movement I have not been able to enjoy literature as much as I would have liked for many years, which I do deeply regret. I have been reading in Bangla, Urdu and English, but they do not fall under the category of literature that I previously enjoyed. Thus, despite being fond of literature, I never consider myself a litterateur. This is not because I am trying to be modest, but due to the fact that my writings have not been written for literary discussions, but for the sake of propagating Allah’s Deen. My political books are also for the cause of Islam. I am rather close to poet Al Mahmud due to our ideological positions and it was he who inspired me first to write my memoirs. He once strongly protested when I claimed that I am not a litterateur. Despite his disagreement I have not changed my mind. The Bangla first translation of Mawlana Mawdudi’s Tafheem ul Qur’an (Towards Understanding the Qur’an) was done by Mawlana Abdur Rahim. His language was of a high literary standard, but it was difficult for the less educated activists of Jamaat-e-Islami to understand. When I voiced my concerns he said, “I have intentionally made the language difficult as I want to prove that Islamic scholars can have good literary standard as well.” He is successful from that perspective, but my thoughts are a bit different as I wanted the translation to be easy for everyone to understand. I started translating Tafheem ul Qur’an from Urdu into simple Bangla myself and began with the final part of the Qur’an. After it was published in 1982 I sent a copy to Mawlana Abdur Rahim for his comments. He wrote, “The language of the last part of the Qur’an is of high literary standard, so its translation should also be of high standard. You have insulted it by using the language of common people.” I replied saying, “I have no objection to the perspective from which you felt this way, but at the same time I think I have received confirmation from you that the general public will be able to understand my translation.” This story proves that I am not a litterateur and do not write for literary purposes. Therefore, I have never been concerned with the literary standard of my writings. However, it was reassuring when Professor Syed Ali Ahsan praised my translation and told me that he had liked my translation of the last part of the Qur’an more than any other translation he had read. I am not only culturally-minded, I am also very fond of cultural works, but I have never been culturally active. The word ‘culture’ is very broad and I am referring to its narrow meaning that refers to literature, poetry, drama, music, art, etc. Many people may become infatuated by literature when they are young, but that craze later disappears when they enter professional life. My younger brother Ghulam Muazzam loved poetry when he was in Class 9, but could not sustain that interest when studying medicine. I also had my poems published in school magazines. I even wrote a few poems dedicated to Allah while in Dhaka Central Jail in 1964. I kept it a secret from my prison cell colleagues. Whereas, if I was a poet I wouldn’t have been able to help but read my poems aloud to my colleagues. There were stage dramas while I was actively involved in Dhaka University hall union, and I even helped manage some drama programmes, but I never felt the urge to do any acting. I acted in two plays in my life, once when I was in Class 5 and the second time when in Class 9. I had never imagined that I could be caught in this way, so I sang a famous Nazrul song dedicated to Prophet Muhammad (PBUH). My aunt was so impressed that she asked me to sing another song and I obliged by singing another Nazrul song. I had never sung in this manner in the presence of others, but gradually I started to feel confident and sang a few more songs. I had not noticed that people started to gather around the roofs of neighbouring houses and were quietly listening to my songs. I felt very uneasy and, with my aunt’s permission, quickly returned to my room. I almost forced myself to leave the house and go to my uncle Shafiqul Islam’s hostel early the next morning. The most famous Bangla litterateur who won the Nobel Prize in Literature in 1913. The National Poet of Bangladesh famous for his revolutionary works against the British Empire and for his Islamic songs. A famous 20th century scholar, academic, philosopher and essayist in Bangladesh. A renowned author, scientist, statistician and journalist in Bangladesh in the last century. Former National Professor of Bangladesh. 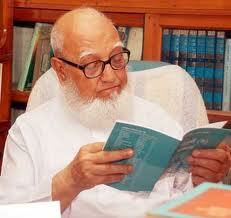 A famous educationalist and founder of Darul Ihsan University in Bangladesh. A Bengali epic poet and writer of the 19th and 20th centuries. Another legendary litterateur in Bangladesh. A legendary Bengali folk singer and composer during British India. A compilation of lyrical poems that earned Tagore the Nobel Prize for Literature in 1913. A Persian Sufi saint and poet. A Hindu monk, philosopher and chief disciple of the 19th century saint Ramakrishna. As mentioned in the previous chapter, I used to visit the office of Monthly Neyamot regularly after starting my education in Dhaka and developed a special rapport with its editor Mr Abdus Salam. Mr Salam informed me that Mawlana Shamsul Haque Fardipuri was a teacher at the Boro Katra Mosque in Dhaka and suggested that I could meet him following the afternoon prayer at Chakbazar Mosque any day. I went to see him accordingly and found him surrounded by some people who were asking him questions on Islamic jurisprudence and he was replying to them briefly with a constant smile in his face. Some people were also asking his advice on their personal problems. I realised that people loved and respected him like a sufi leader. I was sitting quietly amidst older and knowledgeable people and felt a bit overwhelmed as I was only a teenager in front of a great Islamic scholar. I kept looking at him and wondering how to approach him, and noticed that he was also staring at me while answering other peoples’ questions. After he dealt with all the questions that day he signalled me to go near him. He shook my hands and asked me the reason for my visit. I was waiting for this opportunity and kept talking to him for a few minutes while the elders around me looked surprised at how a scholar like him was listening to a young boy with such interest. I told him how I was introduced to Mawlana Ashraf Ali Thanvi’s works in the Neyamot magazine through his translations and asked him where I could find his books and whether I could visit him sometimes. He affectionately stroke my back and told me that I was always welcome to visit him and that his books could be found in the library below the mosque. I became a regular visitor of the Chakbazar Mosque to listen to Mawlana Faridpuri. It was difficult to find him alone; there would always be 15/20 people around him who used to ask questions about different issues of Islamic jurisprudence and other religious advice and I would learn valuable things from his answers. I didn’t ask too many questions, but would only listen to his conversations with others. After the question and answer sessions finished he would inquire about my well-being and ask which books I was reading and recommend which ones to read next. He later left Boro Katra Madrasah and began a new madrasah at Lalbagh Shahi Mosque. My communication with Mawlana Faridpuri became infrequent while I was in university. I met him several times after I joined Tabligh Jamaat and attended monthly meetings of Tabligh at Lalbagh Shahi Mosque. Our meetings occurred even less often after I started teaching at Rangpur Carmichael College, though I met him several times for Tabligh programmes. When I used to speak at the monthly meetings of Lalbagh Shahi Mosque I heard that he listened to my speeches with interest. When I went to see Mawlana Fardipuri in 1954 after joining Jamaat-e-Islami, he became very happy and hugged me. Finding everyone surprised he said, “I knew from his speeches in Tabligh Jamaat programmes that the programmes of Tabligh can’t keep him for long.” He asked the people around him, “Didn’t I tell you this?” A number of them said, “Yes, you had said that several times”. My close relationship with Mawlana Faridpuri contributed immensely towards my development as a Muslim. What I admired most about him was his big heart. The general trend is when people are involved with a type of religious organisation, they usually don’t regard other similar organisations very highly, but Mawlana Faridpuri was an exception who always acknowledged contributions of everyone who served Islam. He used to encourage me while I was in Tabligh, and the encouragement even intensified when I joined Jamaat-e-Islami. When Ayub Khan banned politics in 1959, Jamaat organised Islamic seminars around the country and Mawlana Faridpuri attended several of them as the chief guest. His health was in poor condition, but he still attended some seminars outside Dhaka. His attitude of acknowledging everyone’s contribution towards Islam influenced me greatly and I tried to do the same when I returned to Bangladesh in 1978 after my exiled life. I wrote a book called Islami Oikko Islami Andolon (Islamic Unity and Islamic Movement), the philosophy behind which was the contribution of Mawlana Faridpuri. The most important teaching I received from him was to respect all Islamic scholars. There can be differences of opinions, but one can learn many things from a scholar because of the qualities they possess. That is why I respect all scholars and try to build good relationships with them, even with those who oppose and condemn Mawlana Maududi. Mawlana Faridpuri took me to speak at different programmes. His concerns for me was at a personal level as well. He once told me, “I can clearly see exhaustion in your face. When I was young like you I was not at all health conscious and due to my negligence towards eating and sleeping I am now suffering from chronic illnesses. I have not been able to fully utilise whatever ability Allah has given me due to my poor health and am wondering how I will answer Allah when He will ask me why I failed to look after the good health He had bestowed on me. You should learn from this bitter experience of mine. Always keep some dry food or fruits with you when you are travelling. Remember to take rest whenever you feel tired. Try to be regular in meals, rest and shower. Always remember that good health is Allah’s blessing and it is your responsibility to look after yourself.” Later in 1957, when political activities were banned during the rule of Ayub Khan, I fell ill and had to be hospitalised. Mawlana Faridpuri came to see me in hospital and said, “I advised you a few years ago about taking care of your health, but you probably didn’t pay much attention to it, and consequently you are in hospital.” I promised him that I would not forget his advice in future, and thankfully, I was able to maintain my health much better after that. If we had more scholars like Mawlana Faridpuri who could show magnanimity like him then there would have been no problem in unifying all Islamic organisations. Unfortunately, despite having so many Islamic scholars and organisations it is the anti-Islamic forces that are governing the country. That is why I miss a scholar like Mawlana Faridpuri dearly. It was Mawlana Shamsul Haque Faridpuri who introduced me to Mawlana Noor Muhammad Azmi. When Awami League formed government in East Pakistan in 1956 with Ataur Rahman as Prime Minister and in charge of the Education Ministry, he created an education commission and declared the madrasah education system as useless and a complete waste. I wrote a big article entitled, “A Framework of Islamic Education” to explain the importance of madrasah education. I met Mawlana Akram Khan, the founder of Daily Azad with the article who liked it very much and published it in his newspaper, and later the then editor of the newspaper, Abul Kalam Shamsuddin, wrote a post-editorial on the article appreciating it. It was this article that ultimately led to my close relationship with Mawlana Azmi. I had been previously introduced with Mawlana Azmi at Mawlana Faridpuri’s office at Lalbagh Madrasah, but did not have the opportunity to be close to him. After the publication of my article Mawlana Akram Khan organised a meeting at his residence and invited Mawlana Faridpuri, Mawlana Azmi, Mawlana Abdur Rahim and others and asked me to join as well. As soon as I arrived Mawlana Azmi hugged me with deep affection and congratulated me for the article. I was really moved by the way he showed his love towards me and gradually our relationship became more and more close. A ten member ‘Islamic Education Commission’ was formed in that meeting with Mawlana Akram Khan its chair and me its secretary. The committee made some recommendations to the government to Islamise the education system and create a link between the general and the madrasah education. Mawlana Azmi made the biggest contribution to the preparation of these recommendations with Mawlana Faridpuri also contributing well. During that process I had the opportunity to work closely with Mawlana Azmi. I met him many times after that and would often see him for his advice. He loved Jamaat-e-Islami so much that he would be keen to advise Jamaat about different Islamic issues from time to time. I was always impressed by Mawlana Azmi’s vast knowledge and thoughtful opinions on different aspects of Islam. I found few Bengali scholars at that time of his calibre. His translation and explanation of Mishkat Sharif  was of high literary standard. However, for the majority of the time he suffered from ill health and I used to feel bad that he could not contribute as much as he was qualified to due to poor health. When I expressed my frustration to him he said, “I received the impression from the doctor that my illness has no cure, but what is the use of having a long life in this condition? I am, therefore, praying to Allah that He gives Mawlana Mawdudi my part of life as he is serving Islam in such a large scale.” I was not aware before then how much he loved Mawlana Mawdudi and after that then my respect for him increased even more. Among other Islamic scholars I was close to and always received affectionate love from were the legendary journalist of Muslim Bengal Mawlana Akram Khan and the founder of Nizam-e-Islam Party Mawlana Athar Ali. Other prominent scholars for whom I have deep respect include Mawlana Abdul Aziz (Khulnavi), Mawlana Ziauddin Aligarhi, Mawlana Mufti Deen Muhammad, Mawlana Mufti Amimul Ihsan, Mawlana Abdullahil Baki Al Quraishi, Mawlana Siddiq Ahmed, Mawlana Syed Muslehuddin, Mawlana Syed Mustafa Al-Madani, Mawlana Syed Abdul Ahad Al-Madani and Mawlana Tajul Islam (may Allah be pleased with all of them). The close bond I had with Mawlana Shamsul Haque Faridpuri and Mawlana Nur Muhammad Azmi (may Allah be pleased with them) and the love and affection I received from these two great scholars have contributed hugely towards my work and development in the cause of Islam. I have come across many scholars of Islam in my life, but I remember these two individuals with special love and respect. They had the magnanimity of acknowledging the contribution of any person who had served Islam. I never heard them talk ill of others. They sincerely wanted the movement for the establishment of Allah’s Deen to be on the right path and would always give me valuable advice. I have always felt that their thoughts on Islam were exactly in the same line. An Islamic religious movement based on the principle of the “Work of the Prophets” inviting to Allah in the manner of prophet Muhammad (PBUH). I was 19 when I completed my high madrasah education in 1942. I learned how to read the Qur’an before my primary education and continued to read the Qur’an in this way for 13 years. I learned Bangla, English and Arabic in whatever way I could in those years and learned about Islamic jurisprudence and customs through books and translations of the Qur’an and hadith. I also learned about moral values from some books in Bangla and English. However, there was no book on Islam that would provoke my thoughts, so whatever I learned and practiced about Islam was outside my educational experience. My grandfather helped me develop the practice of regular prayers and daily recitation of the Holy Qur’an. He also taught me some essential Islamic food etiquettes, such as starting to eat by saying Bismillah, ending the meal with Alhamdulillah, not wasting food etc. While staying in student halls I could guess fellow students’ family backgrounds by their food etiquettes. Some had very annoying habits which made me feel the importance of learning these etiquettes during childhood, as it is difficult to teach such things when people grow older. I don’t know why, but I loved to listen to waz from childhood and used to organise children of my age to walk a few miles to attend waz programmes. The speakers at that time would quote poets like Sheikh Saadi and Mawlana Rumi more than quoting from the Qur’an and hadith. They would recite works of those Persian poets in such beautiful melodies that we enjoyed them even without understanding what they meant. Their explanations of those poems and the lessons behind them were very catchy and I used to feel how they influenced me in my life. The teachings of those wonderful stories, such as the importance of truthfulness, the dangers of telling lies, the negative effects of causing harm to others; the humiliating consequences of breaking promises and so on would be explained so eloquently that I realised how some of these vices could lead to troubles in this life. Allah secretly taught Adam (PBUH) answers to some questions that the angels failed to answer. Does this mean Allah was not impartial? Many people narrate the story that if Adam and his wife Hawa (peace be on them) did not eat the forbidden fruit then they would have stayed in heaven forever. If that is true, then what about Allah’s declaration that He created human beings as his representatives on this earth? If Adam (PBUH) was sent to this earth as a punishment then how did he acquire the status of prophet? I found brilliant answers to all these questions that used to bother me in Tafhim-ul-Qur’an and thought of writing on this issue separately. While I was in jail in 1992-93 I wrote a book named Adam Srishtir Hakikot (The Significance of Adam’s Creation) where I analysed the seven places in the Qur’an where the story of Adam (PBUH) and Iblis are narrated. I tried to prove that the real significance of this story is very different from that which is commonly narrated in waz programmes. As already mentioned, there were no textbooks that succeeded in enlightening me with the knowledge of Islam as a way of life, and the books I used to borrow from my madrasahs’ libraries were of no use either. When I was in Class 8 in Comilla a student two classes senior to me called Abdul Qayyum used to live as a tutored lodger in a house on the way from my madrasah. He used to call me and my friends to his room and give us some snacks to eat and read to us from a monthly magazine. I started to like the content of the magazine after a few visits and came to know that it was a Dhaka-based monthly magazine called ‘Neyamot’. It used to contain translations of waz by Mawlana Ashraf Ali Thanvi (may Allah be pleased with him) translated by Mawlana Shamsul Haque Faridpuri. Abdul Qayyum never let us borrow his books; he preferred to read them aloud to us. Most students stopped calling on his residence after a few days, but I found my visits very fascinating and continued to visit him. I was very impressed by the waz of Mawlana Thanvi. He used to recite a particular portion of the Qur’an followed by its translation and explanation in a very logical style giving us a clear idea about the main aspects of those verses. The monthly Neyamot would consist of one topic from his waz every month. I was so overwhelmed by this that I would eagerly wait for each new edition and until it arrived Abdul Qayyum would read to me from other books by Mawlana Thanvi. I can never forget the contribution of Abdul Qayyum in creating my interest in Islamic literature, through which I was exposed to the writings of both Mawlana Thanvi and Mawlana Fardipuri. When I started Class 9 in Dhaka I went to the monthly Neyamot office and became a subscriber. I developed a good rapport with its editor, Mawlana Abdus Salam, who was from my own district of Brahmanbaria. It was he who introduced me to the great personality of Mawlana Shamsul Haque Faridpuri. Until then I understood Islam as a religion from my parents and grandparents and obeyed their orders in practising it. Although Mawlana Thanvi’s books gave me the confidence that Islam was a logical religion, I was still not aware that it was a complete way of life. However, Mawlana Thanvi’s greatest contribution to me was that he created my thirst for learning Islam. Praying in congregation: When I was in Chandina the mosque was a little far from our house. He used to pray five times at the mosque and encouraged us to do the same. He would become angry if we sometimes failed to go to the mosque. When we moved to Dhaka in 1953 he used to pray regularly at the mosque next to the Ramna Police Station. The distance to the mosque in Dhaka was similar to that of Chandina. When my eldest son was in Class 6 he arranged prayers in congregation at home. The first reason was that he found it difficult to walk to every prayer due to his arthritis, and secondly he wanted his grandson to grow the habit of praying in congregation. He subsequently decided that he would build a mosque on his property in Moghbazar. He realised that it would be difficult to take all his grandchildren to the mosque near Ramna Police Station, so it was necessary to have a mosque at home. The first floor of the present three-storeyed Moghbazar Kazi Office Lane Mosque was built entirely from his own expenses without any external help. The mosque began operating from the first day of Ramadan in 1971. I found very few students with a beard in university. Even students of Arabic and Islamic Studies hardly had a beard except those who came from madrasahs. The only prominent academic with a beard was Dr Muhammad Shahidullah. After retirement Dr Shahidullah used to run a Qur’an class in the prayer room of Fazlul Haque Muslim Hall, which I used to attend regularly. He was a short man, but his beard was quite big compared to his physique. One day, he held his beard in his fingers and asked, “How much does my beard weigh?” When students found this question quite surprising he said, “Then why do most of you shave your beard? Do you think it is too heavy?” He also said that people look at bearded people with respect. This I found to be very true throughout my life. During my terms at the Dhaka University Student Union I used to notice that students would behave more gently when I was around. Even the only female member of the union would cover her head when I used to come to the union office. Wearing clothing above the ankles: My father would never hesitate to suggest to people not to wear clothes below the ankles. As there are strong words against it in the hadith, he was justified to put emphasis on this. None of my classmates were concerned about this, so my clothes also used to be below the ankle. I would only raise clothes above the ankle before prayer and roll them back after finishing the prayer. However, we never dared to wear clothes that crossed the ankle in front of my father. We would pull our pyjama bottoms up to ensure that they were above the ankle before we met him and go back to the previous position afterwards. This behaviour was completely unacceptable. After reading the book Witness unto Mankind by Mawlana Maududi I realised that this type of behaviour is normal if one is not fully aware of what Iman (faith) means and does not develop the true spirits of Islam. I stopped wearing clothes below the ankle as soon as I became truly conscious about Iman and Islam. Wearing shirts and trousers: No one in our family was used to wearing shirts and trousers. My uncle Shafiqul Islam was a student leader during the Pakistan movement and used to stay in the famous Bekar Hostel of Kolkata while studying at Kolkata Presidency College. Yet he would always wear pyjama bottoms and shirts and never wore shirts or trousers. When my younger brother started hospital duty in the third year of his medical college studies in Kolkata Medical College, he wrote a letter to my father seeking permission to wear trousers. He didn’t dare to wear trousers himself without my father’s permission due to my father’s uncompromising attitudes towards religious practice. My brother thought it was necessary to avoid his long shirt touching the patients and as it would look very odd to tuck his shirt inside his pyjama bottoms, he thought it would be better to wear trousers. My father replied, “If you can’t study medicine without wearing trousers, then it is better to leave this subject.” With the grace of the Almighty this brother of mine passed with a gold medal award wearing pyjama bottoms and shirts throughout his student life. I too spent my university life, including my roles at hall and university unions, wearing pyjama bottoms and shirts although most of my fellow students used to wear shirts and trousers. When I started my teaching career at Rangpur Carmichael College in December 1950 I found it very difficult to keep myself warm with pyjama bottoms and shirts, so I had to wear warm trousers and a sherwani. I ensured that my tailor stitched the trousers above the ankle. When I arrived back home for holidays wearing sherwani and trousers I found my brother Dr Ghulam Muazzam and my father sitting on the veranda. I observed that my brother was staring at my trousers and then looking at my father. After doing that for several times my father understood what he was thinking. He said to my brother, “I never considered wearing trousers to be haram, but had thought that trousers are always worn below the ankle. I was unaware that it was possible to wear trousers above the ankle. That is why I didn’t give you permission to wear trousers. I have no problem if you wear trousers above the ankle. However, although wearing shirts is permitted in Islam, I don’t like it.” After this my brother also started wearing trousers. When Dr Ghulam Muazzam went to London for higher studies he took with him warm trousers and a sherwani. One of his classmates told him that he would not be given his degree if he didn’t wear a suit. I heard from my brother that his individuality was rather appreciated and he was always praised as a good student. When Dr Muazzam was working as a pathologist at Dhaka Medical College, the principal once told him, “You should come properly dressed.” Dr Muazzam asked him, “What dress is proper according to you?” The principal, in a rude voice, said, “Don’t you see what other doctors wear?” Muazzam replied in a firm voice, “I have seen sweepers wearing that type of dress in England. It is their national dress, not the uniform of a doctor.” The principal preferred to remain silent after this. Some people may not like my father’s strict attitude towards religious principles, but the lessons I had from this have been extremely valuable for me. We do everything for our children’s worldly successes and never hesitate to sacrifice for them, but how many parents are serious about their success in the hereafter? I have seen many pious people not even bothering to ensure that their children pray five times a day and not worried if their daughters don’t wear the hijab. They are only happy if they do well in their exams and succeed in this world. They forget that they will have to answer to Allah on the Day of Judgment if their children are derailed due to their negligence. If my father had not been strict then it would have been difficult for his children to lead an Islamic lifestyle being brought up in a secular educational environment. There is little scope of bringing up our children as a Muslim in our general educational system. Those who are able to live as a Muslim have been able to do so only because of their parents’ influence. Teachings of the Prophet Muhammad (peace be upon him) including sayings, actions and tacit approvals. A traditional Islamic gathering with massive attendance in Bangladesh with an Islamic scholar speaking about different aspects of Islam and narrating stories about the prophet and his companions. A prominent late 19th and early 20th century South Asian scholar from the Deobandi school of thought. A type of trousers worn in Bangladesh as distinct from the salwar bottoms worn in Pakistan. A knee-length coat buttoning to the neck, worn by men from South Asia.